The era of Cloud-based playout is just beginning. The challenge for broadcasters is how to move forward: Expend time, effort, and resources to integrate existing infrastructure with Cloud playout – or – wait for existing infrastructure to be replaced with Cloud-enabled technology? Cloud-based playout is marked by the transition away from facility-based devices — video servers, switchers, and graphics devices — to Cloud based devices & content. This transition will most likely occur over the next 5-7 years, perhaps longer, and require broadcasters to journey from the known to the unknown, from physical to virtual. Broadcasters will have to travel this path while continuing to maintain current infrastructure and, most importantly, stay on-the-air. Any tools that simplify and ease the transition will be invaluable. Making the Cloud look and act like known physical devices — video servers, switchers, graphic devices — clears a major obstacle to Cloud adoption. Broadcasters want the security of knowing how and with what operator tools any Cloud playout solution will be controlled. 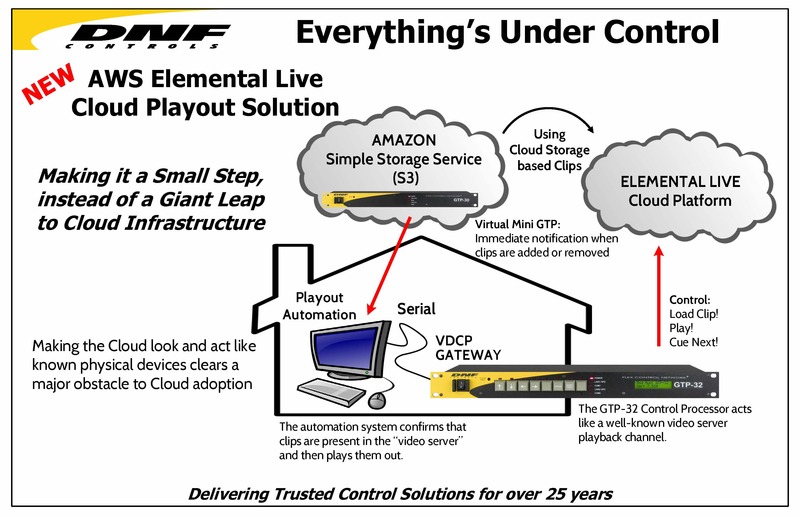 For DNF, the answer is simple: Operators will control their Cloud playout via the same familiar automation workflows and control systems they’ve been using for facility-based physical infrastructure. To emulate known physical devices, the Cloud interface must support a myriad of protocols and their individual variations and communication needs. An in depth understanding of industry protocols, as well as workflows, is essential for successful implementation. DNF’s knowledge of, and experience with control makes it uniquely qualified to deliver interfaces that would enable Cloud platforms to look and act like known physical broadcast devices, thereby making a small step of the giant leap to Cloud infrastructure. DNF has earned the trust and respect of the broadcast community with a strong track record of delivering control solutions that meet technical and operational needs… and just work.